If you are looking for a very simple & quick dinner, this is it! Last week, everyone in our house seemed to have the cold bug going around. Sniffles, sore throats, coughs; I’m sure you all know the drill. The husband seemed to be feeling extra crummy one night. On top of all this, I was running around like a crazy woman with packed full days. An easy soup recipe was a no brainer. 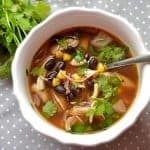 What I love about this one is that it’s full of protein with black beans and chicken. 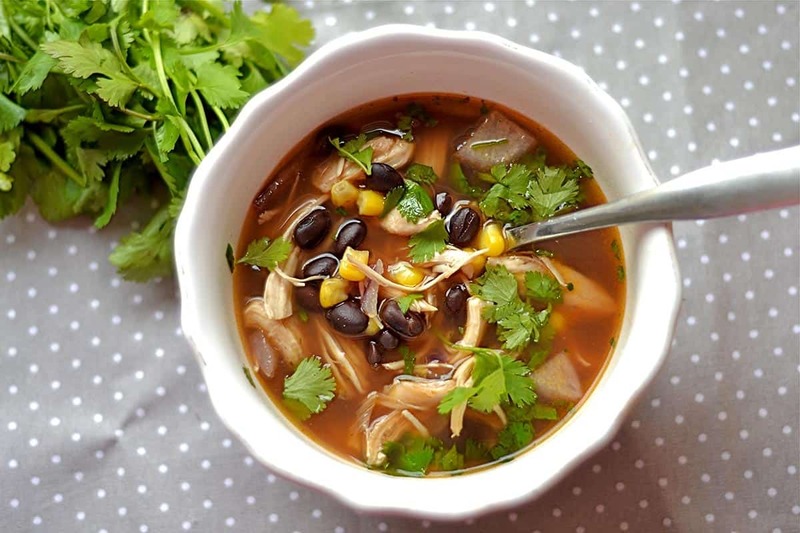 It can be easily customized to a vegetarian soup by omitting the chicken and adding another type of bean such as kidney beans or by adding sweet potatoes. 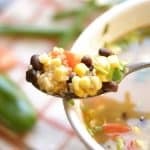 This is a Paleo adaptable recipe by omitting the beans and corn (maybe substituting it with sweet potatoes). 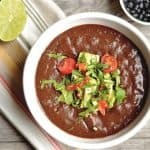 My husband actually hates beans as I am sure you have read before. I have to add them in after I serve his bowl. High maintenance I tell ya! He did comment that it was the perfect meal given his symptoms, so I guess the hard work of separating the black beans was worth it after all. And oh by the way, I forgot the liquid smoke and chicken broth in this picture. Whoops. It happens. 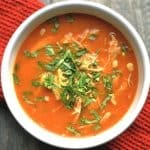 This is also a great meal for little people too; it happens to be Miss Carbivore’s favorite soup and one of her favorite dinners. I do like to add in liquid smoke to give it more of smoky flavor. It can be easily found in any grocery store near the Barbecue sauce, but honestly, the soup is still perfectly tasty without it! Heat olive oil or butter in a pan over medium heat. Add chopped red onion and corn. Saute for about 5-7 minutes until onion becomes clear. 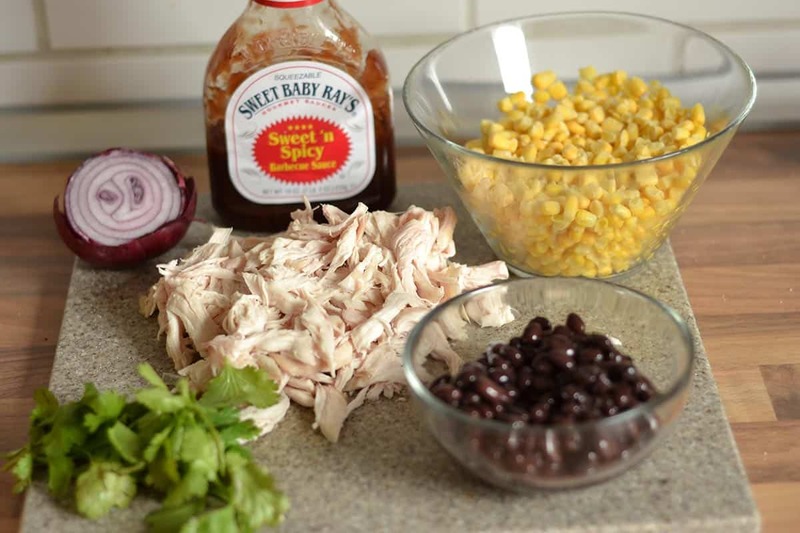 Add chicken, black beans, broth, barbecue sauce, and liquid smoke. Funny that the original ugly photo is still appearing in the recipe box. Just a quick side note. I had seen a few friends share this recipe on Facebook describing how much they loved it. All I could think about was how horrific the picture was! I decided to re-make the soup and carve out a whopping 10 minutes of my day to cook it for a weekend lunch. Phew. The picture has been deleted. But just for fun, you can still see the original in the recipe box. What a difference right?! This was the second recipe I had ever created on my blog, so you know, it wasn’t my best. It’s a delicious soup though!! 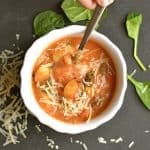 I love a quick and easy soup recipe == makes life so much easier! Me too! Made it as an easy lunch the other day for my kids. They love this one!